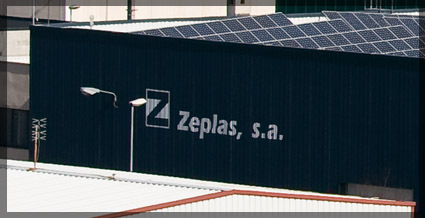 Zeplas manufactures injection moulded parts from all standard polymers. Our company can develop products and processes and manufacture components in many shapes and sizes for your specific industry: from small precision components to large-volume parts weighing up to 6 kilograms. The company was founded in 1979 in Navarrete (La Rioja) with the same corporate purpose it has today, processing raw plastic materials to to manufacture plastic parts using injection methods. Its business has grown significantly over the years, leading to two changes of premises —always within Navarrete— in order to expand and improve its facilities. 1986 Move to new facilities covering 1,600 m2. 1992 Creation of Quality Department This same year the company became an approved supplier for companies in the automotive and electrical appliance industries. 1996 Move to new facilities at the Lentiscares Industrial Estate in Navarrete (www.poligonolentiscares.com), providing another 4,200 m2 of floor space. 1998 Creation of an investment company for renewable energy projects located in La Rioja. 2001 Creation of SERIGRAFÍA Y PLASTICOS, S.L., a company that manufactures plastic parts for furniture and silk-screens plastic parts. 2001 Creation of NSZ MOLDES Y UTILLAJES DE PRECISION, S.L, a company that builds, modifies and repairs injection moulds. 2001 Extension of facilities adding another 1,500 2. 2003 Creation and implementation of the Project Development Department in order to design and develop complete projects for clients. 2004 Implementation of constant pressure gas-assisted injection moulding technology. 2004 Implementation of multi-material injection moulding technology.